The general public can access 5 library computers located on the 1st floor across from the front desk. Use may be limited to 2 hours and all data and files are erased when computers restart or applications are closed. Computers will restart and all data will be lost after one (1) hour of no activity on mouse or keyboard. 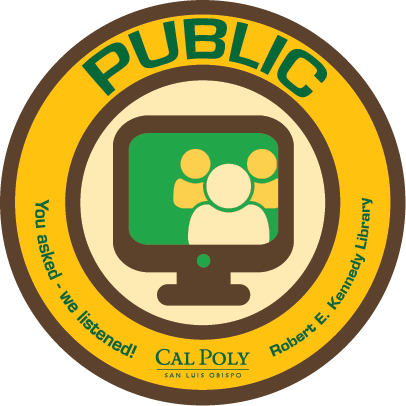 All public computer stations are subject to Kennedy Library’s computing policies. Warning! Closing the browser will erase all work and restart the computer! Save your document to your USB Drive (under Computer application in browser menu). Save your document to a USB drive or email the document to yourself. Print from your USB drive on the copiers located at Cal Poly Print & Copy (located in Hub24 on the 1st floor) which accepts coins. You can use cash, credit or debit cards. Note: there is a $1.50 minimum for this service. Assistive software is available on the ADA workstation (Read & Write Gold, ZoomText, JAWS and MS Office assistive tools). Please see the front desk for assistance. Click the “ReportComputerProblems” link in the browser window, upper left. Ask at the front desk, located adjacent to these workstations. SensusAccess is a self-service, alternate media solution made available by Kennedy Library to automatically convert files into a range of alternate media including audio books (MP3 and DAISY), e-books (EPUB, EPUB3 and Mobi) and digital Braille. The service can also be used to convert inaccessible files such as image-only PDF files, JPG pictures and Microsoft PowerPoint presentations into more accessible and less tricky formats. This service is available at no charge for all Cal Poly students, faculty, staff and alumni. We call that Inclusive Technology. There are also several assistive technology workstations equipped with ZoomText large print keyboards and height adjustable tables . The locations of these workstations can be found on the maps page. Read more on our assistive technology initiative. Read more on our accessibility pages. Yes! Tuesday! It's 1:09pm right now.